The further I get in my own personal journey in learning about healthy living the more I realize it really isn't so complicated. It's all about balance. Where there is imbalance there is disease. Is your body ph (acid to alkaline) out of balance? Is your good bacteria to bad bacteria and fungi out of balance? In this article we will look at balance between Omega 3 and Omega 6 and how to find your balance. I'm sure you've heard about how great Omega 3's are for your health. Omega 3 and Omega 6 are both essential fats, meaning our bodies need it to function and can't produce it on their own. We have to obtain it by diet. 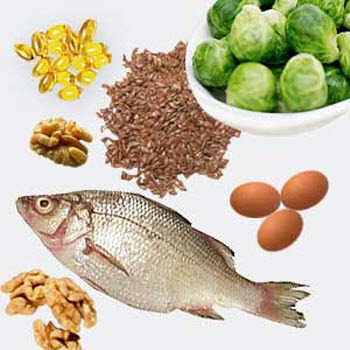 Omega 6 isn't bad we need it, it's just that we have too much of it in our diet compared to Omega 3's. They typical American diet is believed to be anywhere from 20:1 to 50:1 of Omega 6 to Omega 3. So what is the ideal ratio? While opinions on this very I believe it's best to aim for 1:1 ratio because this is what Dr Mercola recommends and I think it's likely that if you aim for equal omega 3 to omega 6 fat you most likely won't get to a 1:1 ratio but hopefully much closer. 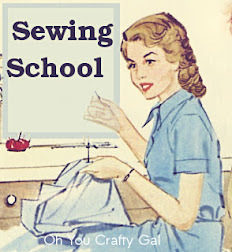 This is what I plan to do anyway. Recently I realized after reading the books "The Clear Skin Diet" by Alan Logan and And the Clear Skin Prescription", by Nicholas Perricone, that I need to increase my Omega 3's. I honestly was not concerned about my omega 3 intake, because I felt like I was already taking care of that. I take a krill oil supplement everyday and don't eat oils like vegetable and trans fats, which we know are bad. and instead I use organic grass fed butter, coconut oil, and olive oil for my oils (of which only organic butter and olive oil has omega 3's,). I also add lots of flax meal into my recipes and sprinkle it on things whenever possible. We also have wild salmon about once a week. But is this enough? Probably not, is what I've humbly realized. I recently went to the library and stumbled upon the book "Raw and Beyond: How Omega 3's is changing the Raw Food Paradigm" by Victoria Boutenko, Elaina Love, and Chad Sarno. What I saw in this book just changed my way of looking at my diet. The authors who are all well known raw chiefs talked about how they realized after years of being on a raw food diet that they were having to low of Omega 3's to Omega 6's because they were consuming high amounts of nuts to get their calories, of which most have very high omega 6 to omega 3 ratios. I never even thought to look at omega 3 to omega 6 ratios in nuts. My husband and I have recently increased our nut and seed consumption and lowered our grain consumption. I thought this was great cause nuts are healthy right? Well turns out they should be used in moderation after all, and if your having a lot of them make sure sure having nuts and seeds that have a better omega 3 to omega 6 ratio (see below). I found a lot of surprising foods that have omega 3's you never here about so I thought I'd share them with y'all. 1. Buy pasture raised animal products When animals are fed corn, grain, and soy they're omega 6 fats grow vastly out of proportion with their Omega 3's. Only grass fed animal products have a better omega 3 to omega 6 ratio and more CLA. The tricky part is you can't just buy organic and assume it has a good omega 3 to 6 ratio because all it's ensuring is that the animal is feed organic food only, which could be organic grains, corn, and soybean. 2. Buy Omega 3 eggs This is something I've been trying to figure out lately. How do you find good eggs? Well I know conventional eggs are just bad, but is cage free, organic, or omega 3 enriched better? I know that you want eggs that have access to outside (less likely to be diseased and gets vitamin D from the sun so their eggs have a higher amount of vitamin D, and you want them to eat grass, produce, bugs, and feed enhanced by omega 3's like flax. So how do you know if they're getting all these things? What's most confusing to me is how to know your eggs are pasture raised and not just in larger cages or allowed to go out onto concrete every once in awhile. To make matters even more confusing there is no legal definition of cage free. So what kind of eggs should you look for? The best eggs buy from a local egg producer that you know of the specific practices used and could even visit to see the chickens yourself if you wanted to (assuming the farmer wouldn't mind having you over of course). I buy Louis Schultz eggs (available to the Twin City area). Second Best choice It seems the best way to know if your eggs are pasture raised is to look at the yolk a deep yolk indicates a foraged diet, which is best. So if you find a brand that has very deep yokes. Stick with that brand! Third Best Choice When in doubt organic labeled with Omega 3's is good because there are at least specific standards in place and you know it has Omega 3's for sure. Forth Best Choice omega 3 enriched, while they are likely caged at least you know that they are fed Omega 3 food and therefore have the right kind of fat. If your on a budget this is what I would recommend because it's typically half the price of organic eggs and the same price as cage free eggs, which has no legal definition and is therefore hard to know if your paying more for better quality. 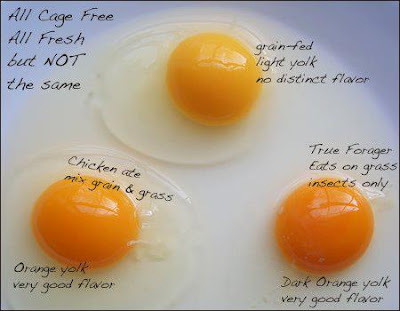 For more info on egg labeling check out my article on egg labeling. 3. Eat more Sea food I know this one is pretty obvious, but what is not so obvious is what kind of seafood has the highest Omega 3's. Below are the sea foods known to be highest in omega 3 but almost all seafood has some omega 3 oils in them. So have lots of sea food, just stay away from large fish because it's high in mercury. Also be careful of how you cook the fish to make sure you don't oxidize the fat. It's best to cook it low and slow and with liquid. According to dietriffic, "One study compared consumption of fried fish versus non-fried fish in relation to atherosclerosis risk. Surprisingly, they found that eating fried fish offered no health protection, even when the fish contained omega-3 fats." Some good sources are listed below. add flax oil in salad dressings and homemade mayo. Vegetables, especially green leafy ones, are rich in ALA, one form of omega-3 fatty acids. Although ALA isn't as powerful as the other omega-3 fatty acids, DHA and EPA, these vegetables offer a host of benefits, from fiber to antioxidants, in addition to omega-3. I've been using nuts in place of grains in many recipes recently. It never accord to me that I should pay attention to the omega 3 to omega 6 ratio in nuts. One important thing to note is that all nuts have more omega 6 fat then omega 3, so while I wouldn't look to nuts as a good source for omega 3's eating the right nuts over others when you do eat nuts could certainly help your ratios. Below is a chart demonstrating various nuts omega 6 to 3 ratio and your best and worst choices of nuts. Omega 3 vs Omega 6 in Milligrams from Nutrition Data. pistachio (also the lowest calorie nut). You'll notice your worst choice for nut butters is peanut butter, 2nd almond, and best is cashew butter. I never thought about beans having omega 3s before, but many do have omega 3s. Some good choices are green beans (which are easy to grow we do every year), mungo, kidney, navy, and pinto. Check out the list below to compare other beans. While fruit doesn't have much fat, they do have a little so if you eat alot of fruit (and especially the same kind of fruit usually) it's a good ideal to make sure your picking fruit with a good omega 3 to 6 ratio. If however, you hardly ever have fruit I wouldn't worry about it. Strawberries and bananas are good options. Below is a list of a few fruit ratios to give you an ideal. So basically in summary it's not so much the amount of omega 3's your consuming but the ratio of it to omega 6 fats that are important. So it's just as important to reduce your omega 6 fat in take as to increase your omega 3 fat in your diet. For example you could mistakenly think hey peanuts have omega 3's maybe I'll just have a PBJ sandwich for lunch everyday. Well that will through your balance way off instead of helping, because it has so much more omega 6 fats. If your not able to get enough omega 3s by diet you can supplement with fish, krill, or flax oil, but beware that some of those oils can be rancid, which is why I would suggest trying to get as much omega 3 fat through diet as much as possible instead and by lowering your amount of omega 6 fat in your diet. I use a supplement that has krill and fish oils because the astaxanthin (the most potent antioxidant that we know of) helps protect the krill from going bad and has enormous health benefits itself. Krill is better absorbed by about 1 and half times, so you don't need as much but it does still come in lower doses than people need. That's why I like having fish and krill oil in one pill.